With an overall DxOMark Score of 71, the Olympus OM-D E-M5 jumps to the head of the pack of micro 4:3 compact hybrids (including the Olympus Pen and the Panasonic Lumix G), riding in 42nd place right behind the Sony NEX-5N in the DxOMark camera sensor score database, smack-dab in the peloton of such cameras of reference as the Fujifilm X100 and Sony SLT-A57. The Olympus OM-D E-M5’s 16 Mpix LiveMos 16 sensor delivers a Color Depth Score of 22.8 bits on our DxOMark test bench. With a Dynamic Range Score of 12.3 EV, the Olympus OM-D ranks 36th in our database for this criterion, outperforming its overall DxOMark score. This is simply the highest score ever achieved by a micro 4:3 sensor. As we will see below on the curves comparing the OM-D E-M5 to the Pen and to the Lumix G, the OM-D E-M5’s dynamic range is superior at all sensitivities, but continues to progress in an even more pronounced fashion at low ISO settings. As for Low-Light sensitivity, the OM-D E-M5’s measured 826 ISO puts it in 40th place, a very good score given the sensitive surface area of its 4:3 sensor, just slightly behind the best APS-C sensors. Furthermore, the OM-D E-M5 beats the score for the 16 Mpix APS-C CMOS sensor found in the Sony SLT-A55, and is competitive with that of the Canon EOS 60D. The OM-D E-M5 introduces a new 16 Mpix LiveMos sensor that we will first compare with the 12 Mpix sensors found in the preceding generation of Pen cameras, the Pen E-P3, Pen E-PL3, and Pen E-PM1. Color depth: The new sensor provides finer gradations, with a score 1.3 Stops better under studio conditions. Dynamic range: The improvement on this front has been spectacular, with a gain of 2EV over the Pen E-P3 and the entire line of older-generation Pen compact hybrids. As for low-light sensitivity, the OM-D E-M5 shows a notable gain on the order of 2/3EV — not bad for a sensor with the same sensitive surface area. Often criticized about their sensitivity, the low-light scores for micro 4:3 sensors usually max out at around 600 ISO. To date, the OM-D E-M5 is the best compact micro 4:3 sensor in terms of low-light sensitivity, achieving a score that is fairly close to those for APS-C sensors. The signal-to-noise chart clearly shows that the new high-end hybrid wins for print-based image quality, with the gap becoming more significant at higher sensitivities. With a DxOMark Overall Score 15 points better than those obtained by its 16 Mpix micro 4:3 Panasonic competitors, the G3 and the GX1, the OM-D takes a comfortable lead and offers a significant competitive advantage. As for Color Depth, the Olympus sensor provides finer gradations, with a score of 1.8 bits better. We found the same difference between the older 12 Mpix Pen sensors as for the 16 Mpix Panasonic sensors. The color depth of the OM-D E-M5 is manifestly better than that of the Lumix GX1 and G3. Dynamic range: At 1.7EV higher, the OM-D beats the Panasonic cameras hands-down. This is a significant gain. As seen on the chart, the dynamic progression for the G3/GX1 starts to stagnate at 800 ISO, whereas that of OM-D E-M5 continues to increase in amplitude, achieving 12.3EV at 200 ISO (a sensitivity that actually translates to 107 ISO). The superiority of the OM-D E-M5 sensor’s dynamic range compared to the Panasonic Lumix hybrids is obvious. Low-light sensitivity: As for sensitivity, the OM-D E-M5 is slightly higher but still at the same general performance level as for the Panasonic GX1 and G3, with a score of 667 ISO for the Panasonic duo vs 826 ISO for the OM-D.
Unsurprisingly, the OM-D E-M5’s sensor score is lower than the excellent scores of the two Sony compact hybrids equipped respectively with 16 Mpix and 24 Mpix CMOS EXMOR sensors. But with only 6 points separating it from the NEX-5N, the OM-D comes closer to such APS-C hybrids of reference than any compact micro 4:3 has ever come before, thus changing the game by reducing the image quality gap between micro 4:3 cameras and these APS-C-equipped NEX cameras. Color depth: The Sony cameras keep the lead by 1 bit, give or take… but in the real world, the difference is undetectable on a photo. Dynamic range: The OM-D is outdistanced by the NEX-7 by one full bit in terms of exposure latitude, which isn’t a whole lot, considering that the latter camera is a champion in this area. As for the NEX-5N, which achieves a score of 12.7EV, the Olympus is evolving in the same direction at 12.3EV, putting it well within the same general category. Low-light sensitivity: With their sensor’s larger sensitive surface area, the two Sony NEX cameras come out on top, but only by a tiny 1/3 EV. The pixel pitch of the OM-D E-M5 is the tightest among the three sensors. In short, this is a great success for a significantly smaller sensor. DxOMark Score: 21 points separate the OM-D from the Fujifilm X10 with its much smaller sensor (6.6 x 8.8 mm vs 13 x 17.3 mm for the Olympus). Color depth: OM-D has a very significant lead of 2.3 bits. Dynamic range: The OM-D E-M5 provides an additional 1 EV of exposure amplitude (always useful). Low-light sensitivity: The difference in size between the sensitive surface areas results in a gap of 1.7 EV between low-light sensitivity scores in favor of the OM-D (826 ISO vs 245 ISO for the X10). This gain is substantial for photos at high sensitivity. Logically, the X10 concedes the game at 1600 ISO. The OM-D E-M5 stretches its sensitivity range up to 25600 ISO. As one can see on the comparative SNR curves below, the OM-D E-M5 achieves the same score at 6400 that the Fuji X10 does at 1600 ISO. The 2/3″ sensor of the Fuji X10 is far behind the much larger 4:3 sensor of the Olympus compact hybrid. Their respective SNR curves speak for themselves. DxOMark Score: Our tests on the Nikon 1 hybrids’ 1-inch CMOS sensor showed it to be powerful and well-designed. But the OM-D E-M5’s new LiveMos sensor brings with it a gain of 15 and 17 points over the Nikon 1 J1 and V1’s overall scores, respectively. The new Olympus sensor scores better across all our evaluation criteria. Color depth: The OM-D shows a gain of one bit, progress that is barely visible in a print, but heading in the right direction nonetheless. Dynamic range: The OM-D E-M5 beats the Nikon 1’s honorable scores with an already comfortable dynamic range that has been improved by 1 EV. Low-light sensitivity: With a more generous sensitive surface area, the Olympus OM-D E-M5 logically achieves a low-light score of more than 1 EV greater than that of both the Nikon 1 J1 and V1: 826 ISO vs 372 and 346 ISO, respectively. The signal-to-noise ratio of the Olympus OM-D compared to those of the Nikon 1. 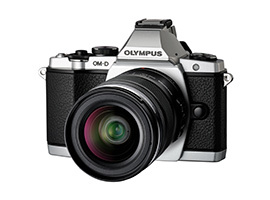 The new Olympus OM-D E-M5 sensor is an important contribution that brings micro 4:3 cameras roaring back into the game. During Photokina 2012, Olympus unveiled two new cameras in the Pen line, the Pen E-PL5 and Pen E-PM2, both of which are equipped with the same sensor as the OM-D E-M5. These Olympus high-end compact hybrids achieve scores that approximate those of their APS-C rivals (such as the Sony NEX). Simply put, the OM-D E-M5 is equipped with the best sensor we have ever analyzed for a micro 4:3, and to date the closest to that of the Sony NEX.